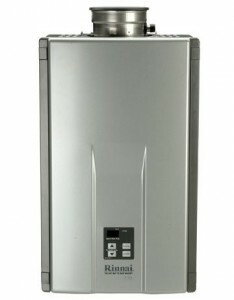 Tankless hot water heaters are the wave of the future. Tankless water heaters have been in use in Europe and Asia for over 20 years. They are gaining wider acceptance and use in the United States. Tankless systems are more energy efficient than traditional tanks because they heat water only as it is being used instead of heating and re-heating water in a storage tank. Since a tankless unit heats on demand, hot water will not run out. This is very useful for large families with larger hot water demands. 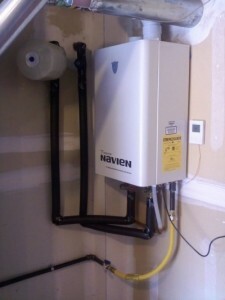 If you are considering upsizing your tank from 40 or 50 gallons to 75 or 100 gallons, we strongly recommend you also consider a tankless hot water heater. While traditional hot water tanks are compared based on gallon capacity, recovery rate and first hour rating, tankless hot water heaters are compared based on flow rate. As long as the home uses hot water at a flow rate below the tankless heater’s maximum flow rate, there is no “recovery”, usage is unlimited. Flow rates for residential tankless hot water heaters are measured in gallons per minute based on a given heat rise (typically 25 or 50 degrees) and range from 4 gallons per minute to 8 gallons per minute. a unit that heats 4 gallons per minute can handle a shower plus one appliance operating at the same time. A unit with over 7 gallons per minute can typically handle two showers and a large appliance. A word of Caution though: If you have galvanized pipes or if you have large gallon per minute shower heads you may want to stay with hot water tanks, We can discuss this with you over the phone. How much will it cost to install a tankless unit? Costs to install a tankless unit varies greatly. Usually an estimate is needed to determine total cost. However total cost generally ranges from $2000 – $4500 installed. You must have natural gas or propane. 200,000 units at full fire. the unit to an exterior wall or outside. the unit cannot provide hot water without power.